Easy 30 minute recipes for weekday cooking - Blog - Halloween Candy…Yum!! After the autumn leaves comes the arrival of our spookiest of holidays, Halloween. I am ready for it this year with three bags of candy and I will be taking part of my neighborhood ghost walk. Since my town dates back to the 1600s there is a ton of history here and, well, some residents just have never left…spooky! I am always hopeful that we will have a bunch of trick-or-treaters and I am always surprised the next day by how much candy didn’t get gobbled up. So here is a quick recipe to take care of some of the excess. Enjoy the fun of creating new candy with your candy leftovers! Stir together candy in a bowl. Line a sheet pan with heavy-duty foil. Put chocolate in a heatproof glass bowl and melt in a microwave. Be careful not to overheat or chocolate will scorch. Stir in pecans and spread evenly with a rubber spatula onto foil-lined pan, shaping into an11- x 7-inch rectangle. Immediately sprinkle candy evenly over the top and chill, about 10 minutes. Break into pieces. TIPS: You can add dried cranberries, cherries and blueberries. 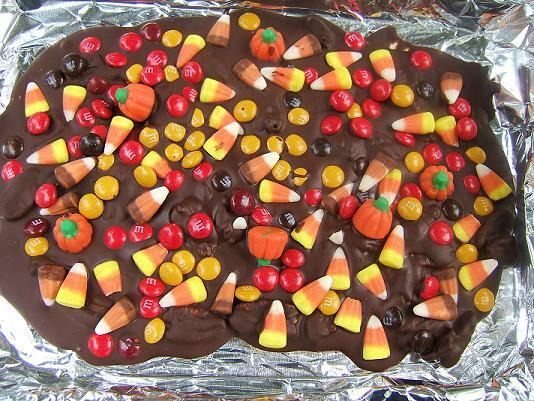 Or chop other Halloween candy bars, such as Kit Kat and Twix, and sprinkle over top of bark.